We spent two weeks at the Symphony villa and had a fantastic time. The immaculate, high quality villa was faultless and had all the amenities you could want. It really is as the photos depict. The views over the bay are breath taking. Daily cleaning and pool maintenance means you get the advantages of a hotel but with the added benefit of having your own privacy and space to live and relax in. The villas are just a couple of km from the nearest village of Kaliviani, where there are three nice quality restaurants. Kissamos town is just 5 km away and has plenty of lovely bars and restaurants serving local food. The small, pretty harbour, just beyond the port has two seafood restaurants which are well worth visiting, you can easily spend a few hours chilling out and watching the boats come and go as you enjoy a lovely fresh fish lunch and enjoy a chilled glass of wine, or two! There are many things to do in the immediate area - archeological sites, various gorges, several wineries and the Biolea olive oil farm is definitely worth a visit. The drive to the west of Kissamos has stunning views as you weave through the mountains, if you end up at Sfinari you will find beach-side restaurants serving fresh local produce, cooked simply but deliciously. Thank you Vassilis for a wonderful holiday where we were able to relax and unwind in beautiful surroundings in the comfort of a luxurious villa. We had an amazing time. the photos are reality. stunning villa with beautiful views. warm welcome before, during and after. The owner is very friendly and helpful and the location is great. If you want a taste of luxury definitely rent the villa. You get what you pay for ! Im August haben wir 11 wundervolle Ferientage in der Villa Symphonie mit zwei unserer Kinder verbracht. Die modernen kubischen Villen haben alle eine fantastische Aussicht auf Meer und Berge. Der Außenbereich ist sehr großzügig gestaltet, der tägliche Service ein Luxus. Die Lage dieser Villen ist perfekt, da man in wenigen Minuten den Traumstrand Falassarna erreicht, Restaurants und Supermärkte sind auch in der Nähe. Die ganze Gegend ist touristisch noch nicht überlaufen.Der Besitzer dieser Villen Vassilis ist genau wie auch seine Mitarbeiter sehr freundlich und zuvorkommend. Wir haben uns von der ersten Minute an wie zu Hause gefühlt.Für uns war dieser Urlaub einer der besten, den wir je hatten! In a fantastic location to explore north west Crete and away from the busier tourist areas this a great place for those looking for a more relaxing holiday. Views of the bay provide the perfect background to swifts, swallows, buzzards, warblers, orioles flowing through the sky or frolicking in the olive groves below. With Gramvousa restaurant only 5 mins drive, a local bakery 2 mins away and many great fish restaurants littering the local beaches you won't want for better local food! The locals are all incredibly happy to see you and Vassilis will great you and tell you all of the best places to go and answer any questions you may have left. Visited the first week in May and the weather was perfect and beaches, towns very un-crowded. Highly recommend this place for those looking for a relaxed beach/poolside holiday. An ultimate experience. You can't imagine any better. The place you want to be to explore Western Crete. You also can imagine your family get together or the most extraordinary wedding party. The lovely Greek church is on the estate. Contemporary Greek architecture in its most extraordinary presentation. 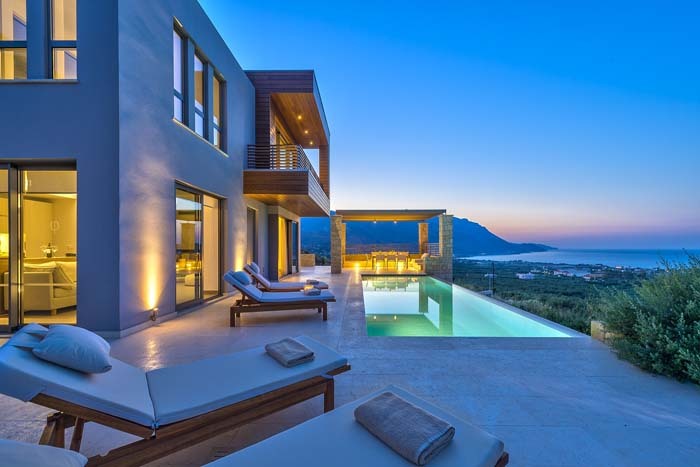 On the hillside overlooking Balos and Kissamos Bay with its romantic Harbor, connecting to the world, in middle of Olive trees and birds songs, you find the most impressive architectural concept. There are about eight 1 to 3 bedroom, fully serviced villas, in an landscaping structure of stone paved connecting trails and beautifully arranged stone walls as well as separating gardens, giving to each villa an estate like feeling by itself. The true difference to a resort. Exclusive and private. The villa offers everything you can imagine from the highest standards of interior design to the outside terraces and their infinity pool. We spent the most relaxing Easter Vacation, sun bathing and swimming in April. Our three children just said one thing: "Super !" We can't wait to go back. Abbiamo soggiornato un mese nella villa Simphony. Villa splendida in tutto. Molto moderna e super attrezzata. Raffreddamento a pavimento strepitoso. La vista e' da favola. Youphoria villas e'situato in un posto super strategico , vicinissimo a due spiagge stupende , Falasarna e Baloos. Kissamos e' un paesino pessimo e deprimente ma qui trovi tutto compreso una sorta di ns Careful. Unico neo..... forse il vento a volte mangiere fuori non era sempre semplice per chi come noi ha una bimba di un anno. Per le coppie puo' essere un vero viaggi di nozze. Merita....probabilmente ci tornero'.